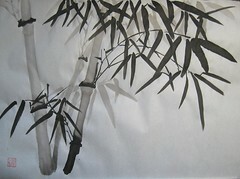 I haven't like the last couple of bamboo paintings I've done... so I tried a few different things last night. 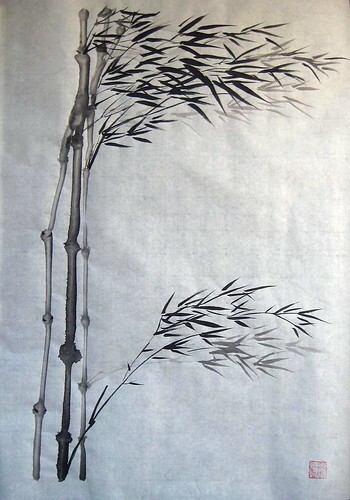 There's a painting by Yuming Zhu of a couple of bamboo from the ground up that made me rethink my scale of my bamboo. I don't think this is... uhm... botanically correct, as the windward side is a bit... sparse, but I liked the concept very much and may do more research to make this better. It does seem more interesting to me, though. Oh, gorgeous! The over-saturated effect is surprisingly effective. I actually like the looseness of it, how the accidental element adds to the picture. It keeps the image from getting too tight and controlled, and lends you experience. I have no idea if this is true, but the second image is so powerful that it feels like it is 7-feet high. Neat! I'm glad you liked those affects... and why. Thank you, so much. Heh. The second and the first are actually on the same size paper. It's just a matter of scale... which is why I had to rethink the scale to see what I really wanted to do. Top one is nice, and bottom one is lovely! Ahhhh! I like these much better! There's more life to them than your previous ones, and that makes it feel more real to me. The second one is especially nice. I like how tall they seem and how you can feel the wind blowing when you're looking at them. However, I don't think you're as "botanically incorrect" as you think, though they are a bit sparse as you've said. Very nice. I like them very much. There's a lot supposedly wrong with the bottom one, but... I think it got the spirit of what I wanted. So it's all the better for that. As you said, they're more alive... and that may be what really counts. Well yeah...most of the points you made are...well...true. BUT! Art is all about gaining a reaction from your viewer, whether its writing or painting or whatever. And since you got such a lovely reaction from us, you obviously attained the true point of art. I like the more leafy look. When bamboo grows wild, it is called a forest, isn't it? That brings to mind leafy things to me. Or maybe that's just because of all the green stuff I have around me. Yes! Kinda like this! Which is mildly daunting... *laughs* But yes, lots of leaves... all at the top of the canopy or out into open areas. Yes, exactly. I like all the green. While I love the heat of a desert, I don't think I'd like the lack of green things visually. Flying over Denver when I was going/returning from Ycon, I was puzzled over the utter lack of trees. it seemed so... wrong. Yeah. We're high plains, nigh on desert, only 12 inches of water a year. So no water for trees, really, other than right around the farmhouses or, of course, in developments, and we steal it all from the Western Slope. It's 300 days of sunshine and the wind blows just as often. The leaves on the bottom one are very good. *smiles* Thanks!! I'm glad you like them... they were fun to put in and try to keep some idea of branches connecting them. They're lovely, and you can really feel the flow of the energy in the bottom one. I think that they are both gorgeous. *hugs you* I'm glad you love them. It's cool to know!! Oooooooh pretty!! The bamboo looks so good! And the leaves are really defined... well, they look defined from here anyway. xD Beautiful!! :D Glad you like... *smiles* Thanks! !